The Plaza Premium lounge is located on Level 3 of Changi Terminal 1’s transit area, one level above the departure concourse up the escalator adjacent to gate C1. The lounge is well signed. If you are departing from T1, take a left turn once you have passed through immigration and you’ll find the escalator pictured above almost straight ahead of you once you reach the ‘C’ concourse. This lounge is actually closer to many gates in T3 than in T1. Gates B1 to B10, for example, are closer to the lounge than gate D49, especially considering there is a SkyTrain to assist. We would only really recommend this lounge if you’re departing from a ‘C’ gate in T1, one of the ‘bottom end’ ‘D’ gates in T1, or a ‘B’ gate in T3. Once you reach Level 3 you’ll find the entrance directly ahead of you (opposite the Emirates Singapore lounge). 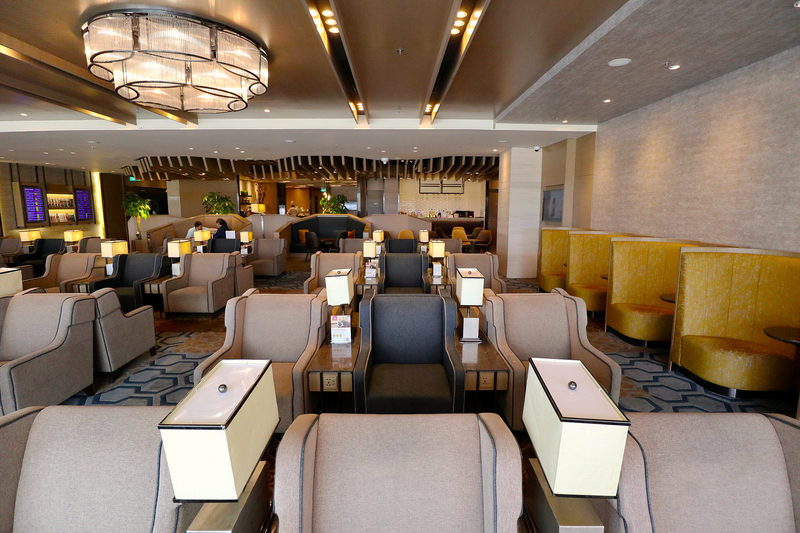 We were heading to Delhi on Singapore Airlines in Suites, but with a late afternoon departure and the whole day to kill, we decided we could do another lounge review before heading to The Private Room for lunch. Since we hadn’t reviewed any T1 lounges at Changi before, we did a poll on our Instagram page to ask our followers which they would most like to see, and they resoundingly voted for this one. Access through these schemes and cards is limited to 3 hours, with complimentary access for children under 2 (accompanied by an adult). You can also pay to simply use the shower facilities, subject to availability and a 30 minute time limit, for US$12.00 (S$16.20). Maybank Horizon Visa Signature cardholders also get 20% off walk-in rates at this lounge outside the complimentary access promotion above (S$44.94 per visit). Those rates are around 25% to 50% less than the regular paid access rates for this lounge. I already have an unlimited visit Priority Pass through my Citi Prestige card, but if I didn’t have that I would be able to access this lounge for S$28 a time as a GrabRewards Platinum member. That’s about half the walk-up or online rate, so I would consider this quite reasonable provided I had at least a couple of hours to kill before my flight. We arrived at around 12.30pm and the lounge was quiet with plenty of open seating options available. Since the Plaza Premium lounge is not a contract lounge for Business Class passengers flying with specific airlines, like the DNATA and SATS lounges, it generally stays a bit quieter. Having said that it does appear that we stumbled on one of the quietest times of day for this lounge, if Google’s ‘Popular times’ feature is to be believed. That does correlate with peak departure times from T1, especially in the evening towards midnight when many long-haul flights depart around the same time. One of the great benefits of this lounge is the large windows across one side overlooking the C gates and one of Changi’s runways (usually used for landing aircraft). Comparatively few lounges at Changi actually have direct external views, so we chose a seat next to the window and settled in. Since we were officially on vacation, it was time to grab a beer and relax before exploring further and taking photos. This is where the first major difference between the Plaza Premium and most other third-party lounges at Changi becomes apparent – there is a manned bar, but most alcoholic drinks are not free. You can however have unlimited ‘Dester’ beer, which is provided on draught. The lounge was quiet during our visit, so as expected the Wi-Fi was fast. We had no trouble connecting, with the password provided at reception and displayed in a few other locations inside the lounge itself. This is a significantly faster network than some of the other third party lounges we’ve reviewed at Changi, especially the SATS lounges which seem to struggle here (indeed the free airport Wi-Fi is usually a faster option in those cases). Overall this is the speed you can also expect to achieve in the Singapore Airlines SilverKris lounges (though it pales into insignificance when you see the speeds we have achieved in the Qantas Sydney First Class and United Polaris SFO lounges!). Nevertheless, a reliable and useable network during our visit. The main lounge seating section comprises six rows of low armchairs, most of which face out over the large floor to ceiling windows overlooking the runway. This section of the lounge alone accommodates 54 guests in the low armchairs and a further ten in the solo side seats. Here you get a side table, charging point and a lamp between each seat. Since these seats are set in trios, if the lounge is busy and only a middle seat is available, you may need to share table space or a charging point with one of your neighbours. Pick the front two rows near the window for the best view. Further back, close to the bar and dining area, there are five sofas set in individual ‘booths’ with a coffee table and two additional seats. These are ideal for larger groups. Each of these booths has two charging points with a small device storage shelf above, however if you’re charging a laptop you would probably have to put it on the floor, or extend the cable to the table. The ten individual seats at either side of the general seating area (five on each side against the wall), still provide a good view towards the window but allow an element of privacy for solo travellers. A small built-in table is provided, more suited to food and drink than anything too productive. The ‘productivity pods’ in this lounge are better designed for those with more serious work to do. See below for details on those. If you’ve visited a Plaza Premium lounge before you’ll know they are big fans of the latest craze in lounge seating – ‘productivity pods’. In this lounge around a dozen of these are located towards the back, past the bar near the showers and resting suites. It’s nice and quiet back here so it suits those needing to work. These are individual spaces for you to get some work done, with enough space for a laptop, a drink of your choice and perhaps even a bite to eat, in relative privacy throughout. Charging sockets and a desk light are also provided in each pod. There are ample power outlets throughout the lounge. Between each seat pair in the large bank of armchairs in the main lounge section there is a multi-standard socket and two USB charging points. These socket types are also included in each of the productivity pods, at the sofa seats, and in the dining area. For whatever reason, the individual seats along the wall in the main lounge section have a different kind of power outlet, the Type G 3-pin Singapore / Hong Kong / UK version. Some travellers will need an adapter plug to use these sockets, and there is also no USB charging option at these seats. Throughout the lounge there are ample flight information screens, showing departures from all four terminals. There is also a good selection of newspapers and magazines if you need something to read. The Plaza Premium lounge has a reasonable food and beverage selection, in a dedicated dining section at the back of the lounge. If you wish to eat in a more traditional dining setting it’s best to do so here, rather than have to do it from a small side table in the general lounge seating area. A long table has bar stool seating, with ample power sockets, and a general seating section has regular tables for two. Along the first wall you’ll find a bean-to-cup coffee machine, plus juices, fresh fruit and breads. There’s also a large fridge with complimentary soft drinks, plus some pre-wrapped sandwiches ideal if you need to grab and go. There is no table service, however there are some made-to-order options from the kitchen. Four regular meals are provided for lunch and dinner, including an all-day breakfast and a Singapore Laksa. There were also two specials during our visit, a cold ramen or a Chicken patty with rice. We were saving ourselves for lunch in The Private Room, but I had a small plate of the steamed fish with some noodles, which was perfectly good. A small salad bar is also provided. We’re also told the made-to-order Laksa is a good one. The small manned bar is slightly further into the lounge than the dining area, also along the back wall. Here you can order complimentary draught beer as mentioned above, or splash the cash and go for a glass of wine or sprits. The wines offered in third-party lounges aren’t usually much to write home about, and most passengers’ expectations are low. When you’re paying for the wine though, like in this case, the ratings are more important. As the ratings suggest, these wines aren’t going to set your heart racing, however the scores are decent and probably a small step up from those we’ve seen offered in the SATS Premier T2 lounge, for example. If there are enough of you, these wines can also be purchased by the bottle at S$38 each, which is actually quite reasonable. A bit of a miss on the ratings front for the Pinot Noir there, but the Sauvignon Blanc should go down much better than the cheaper Woolshed option. Complimentary mixed nuts and tortilla chips are also available to accompany your drink. One omission from the drinks line-up, for those celebrating, is a sparking wine or Champagne option. While this would obviously be chargeable like the other drinks, we think there would be sufficient interest to justify offering this. We didn’t need a shower but we booked one to take pictures for the review. As we mentioned the lounge was quiet and all five showers were available at the time. Busier periods may incur a wait so put your name on the list as soon as you arrive in those cases. I was allocated shower suite number three. The key is obtained from reception or one of the shower staff. No time limit is mentioned. The shower suite itself is small but perfectly adequate, with private toilet and washbasin facilities. Shampoo and body wash are provided in the shower plus a ‘missing’ dispenser, in my shower at least, which presumably once featured conditioner. Some fresh amenities are restocked for each guest. Nothing special but a toothbrush and toothpaste, comb, shower cap and cotton buds can come in handy if you haven’t packed what you need in your hand luggage. There are two ‘VIP rooms’ in this lounge. We weren’t really able to make out what or who they are for, but essentially they are partly screened rooms in the quiet section of the lounge, with four seats and a couple of side tables with lamps. The lounge also features three private ‘resting suites’, effectively small hotel rooms (though they don’t have en-suite facilities so you must use the general lounge restrooms / showers). Suites A and B are solo rooms with single beds, a phone, small desk with a stool and a small wardrobe. These aren’t unlike the single rooms you might find at a transit hotel like the Aerotel Changi (see our review). The Changi Aerotel connection is not coincidental here, Plaza Premium runs that facility too. Suite C is a more spacious family room with a double bed and a single bed, a full-size desk and much more wardrobe space. Additional time can be purchased as required, if you have a longer transit. The Plaza Premium Lounge in Changi T1 is probably one of the nicest third party airport lounges we’ve ever visited. It’s on the small side, but wasn’t busy during our visit. Decor is modern and follows the Plaza Premium theme, with a good number of plants spread through the lounge to give it a calming feel. A decent range of reading materials is also provided. There are a number of seating options, good food and drink options including made-to-order dishes, a fantastic view and good Wi-Fi. That’s not to mention the clean shower facilities and optional nap rooms. Unfortunately the more premium beers, wines and spirits attract a bar charge in this lounge, however soft drinks and draught beer are freely available. Overall a very nice experience. We would even consider this lounge over the third-party options in T3 for flights departing from the ‘B’ gates, due to its location. Love this lounge, was there a few days ago I have PriorityPass and have never paid for wine there. They usually stamp your boarding card and check if you get free booze or not. This week they did not even as me to show the stamp. So I guess some of the cards or ways to access do not get free booze. BTW, they also always have sushi wraps on offer made to order. Was there exactly a month ago. This is my favourite 3rd party lounge at Changi Airport (all 4 terminals included). There is free white wine or red wine in addtion to beer. If you’re not sure if you qualify for free wine, show your card and ask. I accessed this lounge free with AMEX Platinum Card (+ 1 guest).